THE Sikkim Himalaya stands square in the path of long-term ecological desecration today as the spectre of development looms over it. To tackle energy shortage, the Sikkim government has proposed a hydro-electric project across the Rathong Chu river meandering through Yuksam in west Sikkim. Sikkim has been classified as a 'bio-diversity hotspot' by the World Wildlife Fund of India in view of abundant flora and the presence of several endangered species like snow leopards, Himalayan black bears and red pandas. It is also home to numerous species of indigenous and migratory birds as well as innumerable species of butterflies. The area-wise distribution and density of species in Sikkim is reportedly the highest in the world. To safeguard its pristine environs against such developmental drives, a group of concerned citzens of Sikkim have come together to form the Concerned Citizens of Sikkim (ccs). The proposed hydro-electric project envisages the chanelling of the Rathong Chu river near the base of Mount Kangchendzonga and constructing a 30 mw power station near Yuksam. What has raised the ire of mainly the tribal population of Sikkim, is the site's choice. Termed the 'cradle of Sikkimese civilization', Yuksam is traditionally considered precious to Sikkim not only because of its virgin forests but also as a sacred pilgrimage spot. Besides, the place is historically relevant: several Buddhist relics have been recovered from the area. The first Chogyal (king) of Sikkim was coronated in 1642 in Norbugang in Yuksam. The stupa of Norbugang Chorten which is a protected monument lies just 5 km away from the project site. The Dubdi Gompa monastery which is also an archaeological treasure is close to the site. And Sikkim's most popular trekking route starts from Yuksam. The construction of a hydel project in this area would obviously cause felling of trees, displacement of local people, landslides, river water pollution and would also threaten Sikkim's fledgling tourism industry. The region from Yuksam (5,500 ft) to Tshoka (10,000 ft) which lies on the fringes of the Khangchendzonga National Park contains one of the last stretches of virgin forest cover in west Sikkim. The battle against the dam picked up momentum when Sonam Paljor Denzongpa, an anthropologist, became the first ccs member to go on a relay hunger strike from June 8. His colleagues Pema Namgyal and Chukie Topden soon joined him. Complete scrapping of the hydel project was demanded. Throughout the campaign, the group reiterated that alternate and appropriate sustainable development projects and eco-tourism holds more potential for Yuksam rather than such a large-scale assault on this fragile land. 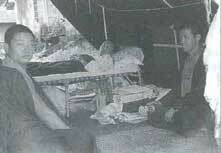 As became vociferous with criticisms, the state government sent emissaries to the hunger strikers to patch up a truce. Initially, the ccs stood its ground for a total stop and review of the project. The agitation received a fillip with the famous cine star Danny Denzongpa, who hails from the Yuksam valley, joining the crusade. On July 4, discussions between the government envoys and ccs members culminated positively after the former agreed to set up a high-level local committee to assess the project, and the hunger strike was called off on July 5. But the ccs still continues its peaceful protests against the ongoing construction at the site despite government assurances of reviewing the project. Says Sonam Denzongpa, "We are determined to carry on with the movement for the preservation of our natural and cultural heritage." Meanwhile, legal proceedings to abort the project have not yielded any result as the High Court, after agreeing to a hearing on June 27, postponed it to August 14. The ccs also sent a memorandum to the prime minister requesting him to "stop immediate construction at the project site and let an independent team to inspect and review the project in view of its negative environmental consequences". Efforts are now directed to procure a stay order on the construction. The ccs's contention is that in the name of 'sustainable development', the state's power department has wrought damages to Sikkim's natural diversity. Says Pema Namgyal, "The power department is implementing the Rathong Chu project without abiding by the laws of the country." It has continued construction without even obtaining the final environmental clearance. The ccs has also charged the power department of misleading the Union ministry of environment and forests (mef) by submitting false reports to obtain the final clearance. Meanwhile, Ashish Kothari, member, Environment Appraisal Committee -- a part of the mef, has come out strongly against the project and in a letter to the prime minister, has urged him to stall the project for violating several environment conditions. The Centre meanwhile, is slowly waking up to the implications of the Rathong Chu project. The environment secretary apparently had not even heard of this project earlier. Challenged and cornered, the Sikkim chief minister, Pawan Chamling, who had earlier warned that "any opposition to development programmes in the state will not be tolerated", has targeted rival party leaders for instigating people. He stated the project was planned by his predecessors and that he was only following it up. Already some Rs 19 crores have been spent. The total cost estimated at Rs 171 crores, is likely to be commissioned within 5 years. Sikkim's power department is notorious for its record of existing hydel projects falling short of their required targets. For instamce, the Meyong hydel project in north Sikkim has a reported target of 4 mw**, but to date has not generated any power. Similarly, the lower Lagyap hydel project in east Sikkim has an installed capacity of 12 mw, but produces a meagre 5.3 mw. Two main reasons attributed to this are that the power houses face massive siltation problems due to continued deforesation in the higher reaches. Secondly, the water channels break frequently as they are built on unstable land affected by massive deforestation. A channel break in April '92 of the Rongni Chu hydel project in east Sikkim even claimed a life. On July 7, the coffer dam on the 60 mw Rangit hydro-power project at Legship in west Sikkim was washed away by flood waters. The power department's belief that only 19 trees from the reserved forest and 88 from the khassmal land will be felled is absurd. Ecological imbalances in the site's choice, too, is likely to be the highest. As for the energy produced, its mishandling of earlier hydel power projects does not speak highly in its favour. Its contention that Sikkim will become self-sufficient by selling power to neighbouring states, is flimsy. Both Bhutan and West Bengal, Sikkim's immediate neighbours are nearly self-sufficient in power. Sikkim is also home to a rich array of medicinal plants which may be extinct if the area is allowed to be submerged. The Chagpori Tibetan Medical Institute in Darjeeling, which conducted a survey of herbal plants in west Sikkim in May 1994, identified rare medicinal plants growing in abundance in Yuksam, Bakhim, Tsoka, Dzongri, Thangshing and Zemathang lake areas. The argument forwarded by the power department that the project would create jobs for the tribal belt also does not cut much ice with the people. The local population normally fall in the category of unskilled and semi-skilled workers for which they may only be paid as daily workers and may not be assured of a regular employment. Their grudge is that they are always stripped of their ancestral land holdings.Some are now left with even less than 2.025 ha of land to sustain themselves. The compensation money doled out to them by the Sikkim government does not help them as the they are ignorant about how to invest money.